Python is a general-purpose programming language that opens many possibilities for developers. 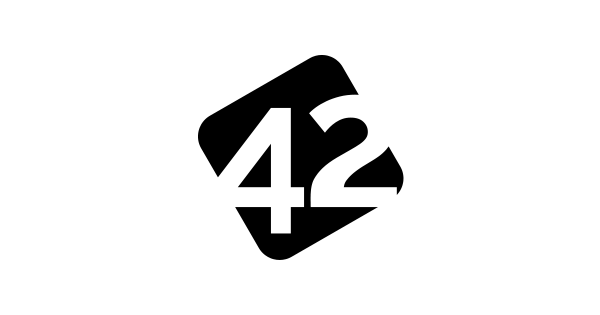 It can be used for creating automated testing frameworks, writing desktop applications, building scripts, system monitoring, and logging tools, etc. It is demanded in a diverse number of industries due to its flexibility. Usually, Python experts are familiar with such frameworks as Django, Tornado, Flask, Pyramid, Zope, Twisted, etc. They are quite demanded nowadays, which defines the sum of money they earn. In our blog, we will give you more information about Python and how to hire Python developers. If you are interested in other types of developers, check out our big research on how much in Ukraine developer costs. As we have already said, a Python software engineer is a rather valuable specialist who is involved in various IT projects. This fact is explained by the statement that this technology is popular and demanded because it allows you to create projects in the field of artificial intelligence and the Internet of Things (IoT). For this reason, initiators of startups look for Python workers for their projects. One of the most attractive options is cooperation with a Python contractor in Ukraine. We decided to find out whether this specialist is in demand within the country and compare this indicator with the demand for him on a global scale. In order to compile the original picture, it makes sense to refer to domestic job boards. If you look at the current job posts at the moment, we will see 125 actual vacancies at Dou.ua, 65 vacancies at Work.ua, 48 job posts at LinkedIn, and 195 at Rabota.ua. Assuming that some companies can post their vacancies on all sites at the same time in the hope of getting the best Python programmers the demand for an experienced and part-time remote Python worker may be lower a bit. Let’s try to narrow our search and find out how many companies are looking for a junior remote Python rock star. Thus, Dou.ua and Rabota.ua offer only 5 vacancies, 6 vacancies for this request are posted at Work.ua. The conclusion is obvious – an expert with junior Python workers skills is not very demanded in Ukraine. Still, we recommend checking to the supply for these experts as it differs much. If we look at the global labor market, it is possible to get a bit different data. So, at the moment, over 99 jobs are posted for German market, 714 for the UK, 17 for Swiss, and 33 for Israeli market on LinkedIn. 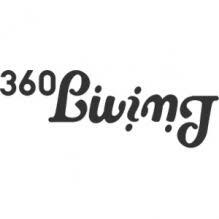 If we narrow the search to junior Python candidates, we will get 45 vacancies for Ukrainian programmers, 67 for German, 11 for Swiss, and 404 for British developers. If we search only remote junior or entry level Python developer in London, then the number of offers will decrease to 9, while there are no remote positions for German and Swiss coders. It is evident that the supply for such devs is much higher than the demand in Ukraine, thus a lot of companies offer remote development services of their employees to European and the US companies what is a great chance to save money and get high-quality development project for the later. According to the PayScale and DOU resources, which our research is based on, Python teams salaries do not differ much from the ones, who know Java and we will prove this fact below. Salaries of developers are usually defined by their experience and sometimes by the size of the project or company, which the programmer is working on. 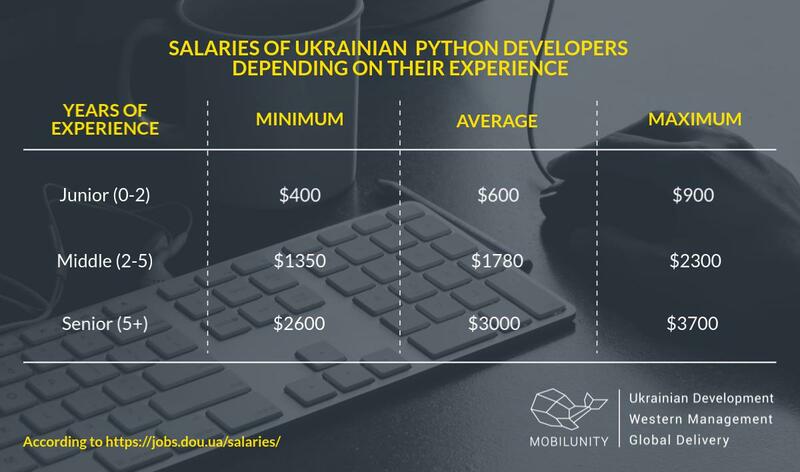 In order to make a comprehensive research of Python engineer salary in Ukraine, we need to compare two main indicators. It is the level of experience and the city in which a certain programmer lives and works. Let’s analyze the first parameter. It is possible to see that Python entry-level programmer salary starts from $400 per month in Ukraine. An average Python salary for a mid-level programmer is approximately $1,780. In its turn, senior Python average developer salary can reach $3,700 for a month of work. In the table above you can see, that the difference between the minimum and maximum Python salaries is huge. It can be explained by the budget of the company, as mentioned above. If the project is small, the salary will be average or minimum, but bigger companies are able to pay maximum Python jobs salary. Let’s have a look at Python programming salary (salaries) in the top 5 Ukrainian cities. Surprisingly, Kyiv is not a leader in this rating, since the highest Python web developer salary is in Dnipro ($2,100 as a monthly payment). The proximity to Europe explains why the indicator of an average Python development salary is also high in Lviv. Here this figure reaches $2,000. In Kyiv Python programmer average salary is also $2,000 which makes this city quite attractive for hiring remote programmers since the supply and demand are rather balanced here. 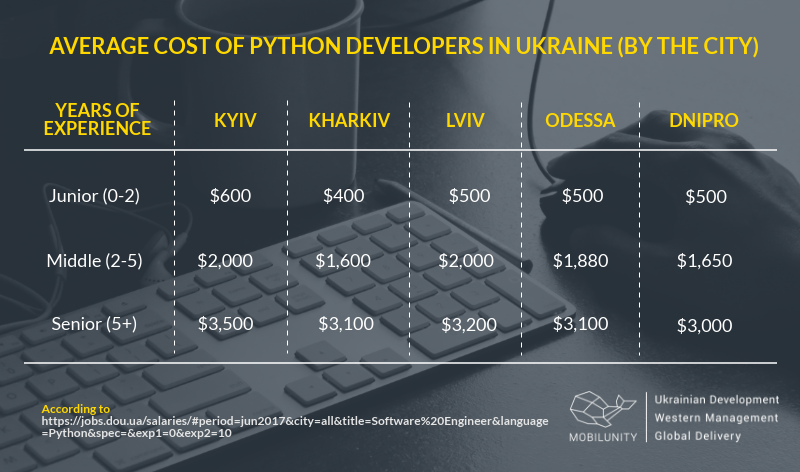 Python developer rates are almost equal in Kharkiv and Odessa: $1,600 and $1,650 accordingly. The highest salaries of junior Python programmers, as well as senior ones, are noticed in Kyiv, while Lviv offers the highest middle developers salaries. What Is Python Developer Salary Compared to Other Skills in Ukraine? If we analyze the Java Python developer salary in combination with the payment rates of programmers using other technologies, we will get the following data. An average junior Java programmer with Python skills salary is $1,300 per month, mid-level experts get $1,900, while senior developers get $2,200 in Ukraine. If we check purely a Java coder wage, the indicator of a mid-level expert will be $1,900 per month as well. Thus, Python developer contract rate or Java in Ukraine are equal. It will be also interesting to discover the level of this programmer salary in other countries. Thus, they are able to receive near $7,200 a month in the USA (it is an average indicator applicable to data for the whole country). If to be more specific, Ruby vs Python Junior developer salary in Chicago is $9,600 and $7,000 as a monthly payment accordingly. Comparing salaries of Java vs Python developers in the USA (Chicago), we get the following rates: $8,900 and $8,900 accordingly. Thus, we may assume that the salary programmer Java vs Python is still the same in other countries. 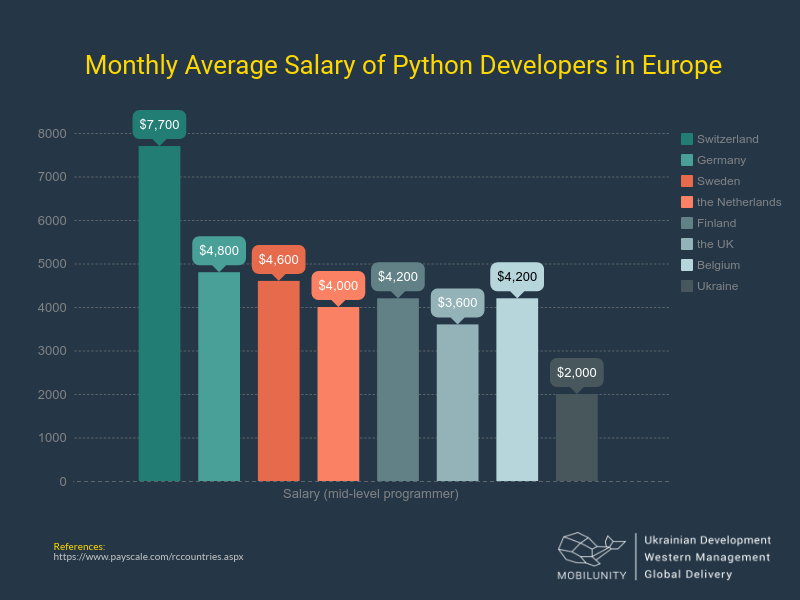 How Much Does Python Programming Cost in Europe? Python developers were popular worldwide due to the research results, which shows high numbers of requests in Google. Still, there are countries, which show the highest results: the USA and the United Kingdom. As usual, the USA offers the highest salaries for programmers of any kind in the world. It will be reasonable to compare Python coder average salary in Ukraine and Europe. For example, Python data scientist (science) salary is $7,700 in Switzerland. The next place in the European rating is taken by Python programmer salary Sweden vs Germany. Here the indicators are $4,600 and $4,800 for a month of work. 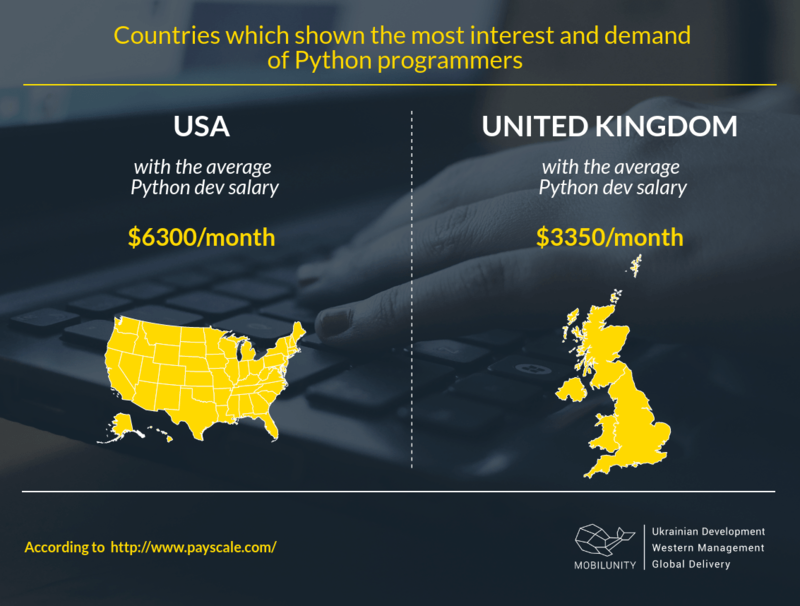 The indicator of Python programming salary in the UK is also not so high and is estimated to be $3,600 as an average. It will be logical to say that recruiting Python coder is the most reasonable in Ukraine and this is one of the main factors to make a decision in favor of Ukrainian programmers. What Is the Cost of American Python Programmers? 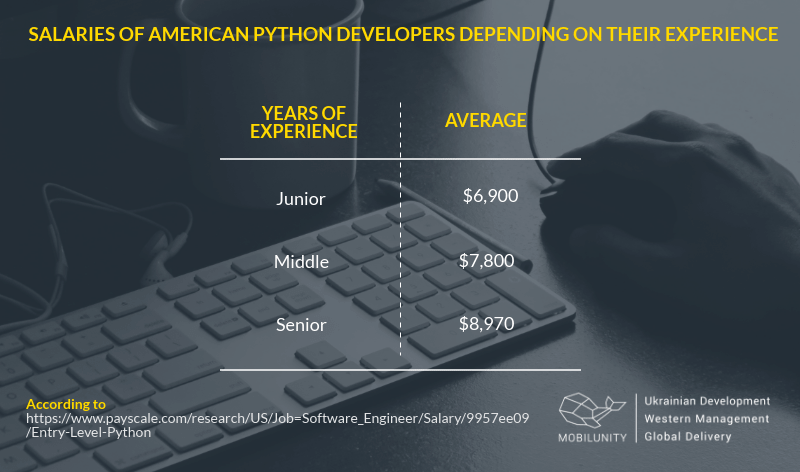 Let’s analyze already familiar parameters in order to evaluate the level of Python full stack developer salary in the USA. Thus, full stack average junior Python developer salary USA is approximately $6,900. (For comparison, if we correlate junior Python developer salaries in Canada (Toronto) vs Germany (Berlin), we will get that an average indicator in Canada is $3,900, and $4,100 in Germany). Python starting salaries for a specialist of middle-level begin from $7,800 and can reach almost $9,000 in the case of a senior developer. It will also be interesting to assess the level of a Python programmer salary in the US. For this purpose, we gathered the data on wages in the leading IT cities in the country to find the upper and lower index of Python salaries in the USA. The results will be as follows. Python programmer cost in California is one of the highest in the country. So, an engineer living and working in Mountain View, CA can receive about $9,200 a month. The second place in this ranking is the salary of a Python programmer in San Francisco, CA. This figure is in an average $9,400. If we look at the junior Python developer salary in VA, Los Angeles, Massachusetts, an average wage for Los Angeles, CA will be $8,300, and a programmer who lives in Boston, MA is able to get $7,000 a month. As for Richmond, VA, an average wage for this engineer is $8,500 a month. Python programmer cost in New York, NY also remains at a decent level. So, the average figure here is $8,100, while a junior Python developer salary in NYC can start from $7,700 a month. This was a summary table of the USA salaries Python, but below we have also distinguished how much-talented engineers earn in the Silicon Valley, the center of American and global innovations. It is worth saying that the level of payment here is quite high. It starts from $7,300 a month in San Diego, CA and rises up to $9,400 a month in San Francisco, CA. s XpoLog continue to grow, Mobilunity continuously delivered high quality, exceptionally talented people and resources for us. We expect to continue and develop our work with Mobilunity in the near future. When there’s a need to find a Python expert, employers find it difficult to decide on a perfect candidate for such a position. There are several criteria you can consider in order to find the best possible Python coder: talent, high level of education, flexible approach to projects, location and reasonable cost. 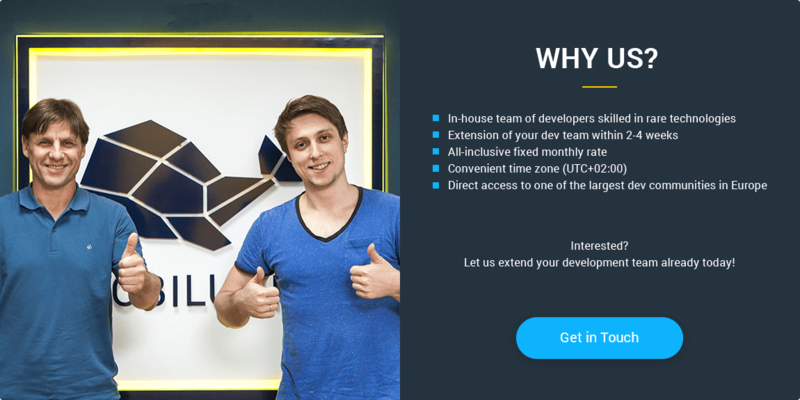 These are the reasons, why Ukrainian developers are great candidates to take into account. Remote Python developer or team will be a part of your processes and workflow. Ukrainian Python programmers have a strong reputation and are known as respected experts for their significant programming skills. Thanks to the good educational basis of Ukrainian coders and ability to improve their knowledge, IT of Ukraine market has a huge developer pool and is considered to be one of the most promising in the world. Average Python programmers salary in Ukraine is almost twice as lower as wages of a Python coder in the USA. You get the same level of knowledge and experience for the much lower rate. Python programmer from Ukraine allows you get cost-saving services remaining a high-quality. Once you decide to hire employees from Ukraine, you will be able to contact them personally and arrange offline meetings, which will be easy and for non-expensive due to the country’s closest location to Western Europe. Due to long-term cooperation with various customers from European countries, our devs have significant international working experience. They have good communication skills and will become perfect team-members of your dedicated developers’ team. 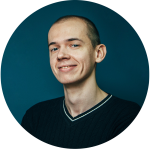 Ihor, Python developer: It became quite popular in academic field coz the fact that its syntax features (constant indentations, the significance of line endings) force it to look clean if you want it to work. That’s why it’s usually the first and main language to teach students programming in western countries. Coz every student knows this language – many scientific libraries are implemented in that language so it’s become de facto the main programming language for scientists too. Its second main advantage is that in contrast to C++ or Java it is interpreted language with the high degree of freedom in terms of interactivity (interactive console, monkey patching, anaconda). This and the fact that it is a general-purpose and very high-level language makes it the best choice for prototyping things. And as we all know – here’s nothing more permanent than a temporary so it is a common practice to create something in Python, acquire funds planning to rewrite it to C++ but instead rewriting bottlenecks only leaving Python code be. The third field of usage is scripting. Every DevOps, every hacker, uses it. Coz its abilities are much higher than in, for example, Bash, but it is still very easy to just write and launch right away. That is how Google, the company whose employee, Guido van Rossum, the creator and still “a dictator” in terms of how Python should look like and how it shouldn’t, was working when it started to use the language for deploying, analyzing, building other projects. If you take any large Google projects – it definitely will contain some Python code. This language is not so suitable for really large projects, but even here it has many successful projects. Reddit, EVE online, Tensorflow, Youtube all of these was fully written in the discussed technology before it was acquired by Google. NASA, for example, uses this language as a language for preflight planning and auxiliary processing during flights. If you are looking for a professional Python developer or team, outstaffing company Mobilunity can give you an access to the most talented Ukrainian candidates. Our recruitment team will find Python rock star fast and provide you with the best employees as evidenced by the positive feedback from clients. With Mobilunity you can find Python worker dedicated to your project easily without additional hassles which often accompany this process. Doing all the best for the customer we always orient on the successful result and our years of experience support us in this. Need a Python developer for your upcoming project? Let us find and outstaff right candidates for you!